The mission comes at the expense of Ness having to take a life in the line of duty. Following some counseling from his cop buddy Jim Malone (“He’s as dead as Julius Caesar… would you rather it was you?”), Ness is able to absolve himself of his guilt and returns home to discover that his wife has given birth to their son. 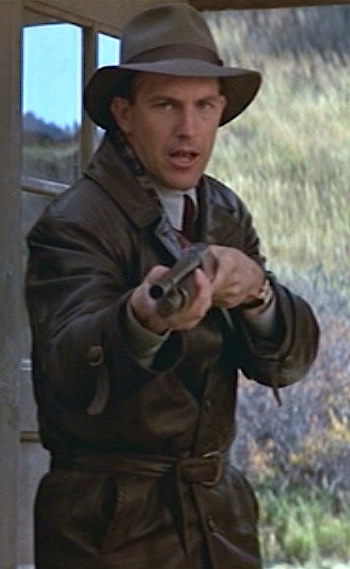 The Untouchables‘ Armani-designed costumes have been praised for evoking the era if not reflecting it with total accuracy. For instance, it is difficult to imagine that a modestly paid – and honest! – federal employee like Eliot Ness would be able to afford a quality leather car coat, especially as fashionable leather outerwear was hardly as ubiquitous during the Prohibition era as it is today. Still, the jacket incorporates the style of the era and helps a modern audience get behind a “badass longcoat”-wearing hero like we’re used to. 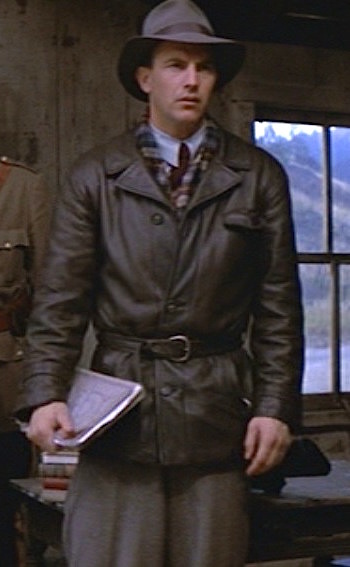 Ness wears a dark brown leather hip-length car coat with three buttons well-spaced down the front and a thin self-belt tightened around the waist between the jacket’s two lower buttons, buckling in the front with a rounded brass single-prong buckle. The lapels have a narrow notch similar to a down-scaled Ulster collar. The cuffs are tightened with buckled belt straps. In addition to the slanted hand pocket on each side of the jacket below the belt, there is a set-in pocket with a slightly pointed flap on the left breast. Replicas of Ness’ leather jacket abound on the internet, but – as always – the quality is questionable. Your best bet is to find a similar-looking vintage jacket that you can make your own. A gunfight in the wilderness is no reason for a gentleman like Ness to forgo formality, so he still wears a tie albeit an appropriately rustic-inspired wool knit tie in maroon red. The Tie Bar currently offers several 100% knitted wool ties in similar colors such as wine red and burgundy, both for under $30. His pale blue tonal-striped shirt has a point collar with such a narrow spread that his the occasional errant collar leaf bends over his tie. The shirt also has a front placket, breast pocket, and single-button rounded cuffs. Ness in moments of confusion and stress. Ness wears gray wool trousers with double forward pleats, straight fly, and side pockets. The trousers have belt loops that go unused as Ness instead wears a pair of dark suspenders that button to the inside of his trouser waistband and can be adjusted with silver-toned belt-style buckles. 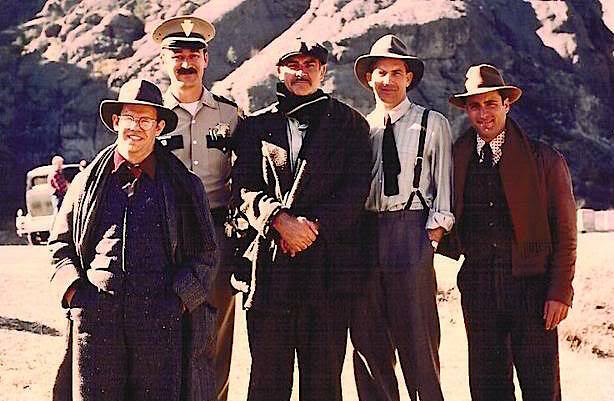 Behind the scenes images of some of the cast on location shows Costner in costume sans jacket and waistcoat. Ness layers up against the cold with a lozenge-patterned wool waistcoat. Although the gray-and-red mini-diamond pattern looks more like something you’d find on a sweater vest, this particular garment is styled and structured like a traditional suit vest with a high-fastening six-button front, notched bottom, and four welted pockets. Ness meets his new son, J. Edgar John James Ness. In real life, Ness had no children until his adopted son Robert was born in 1946. The bottoms of Ness’ trousers are tucked into his dark brown leather lace-up boots that he wears for riding. The boots’ brown laces are tied through wide silver hooks up the shaft where a slim brown leather strap tightens the top of each boot around the calf. Ness continues to wear his usual gray felt fedora with its high, pinched crown and narrow black grosgrain band. Wallace draws Ness’ attention to an interesting point in the ledger that may seal Capone’s conviction. Shades of red, white, and blue in Ness’ maroon, gray, navy, and beige plaid wool scarf evokes his “All-American” sense of law and order. Before the raid, Ness wears a pair of brown leather work gloves with a short leather strap across the front of each wrist. As soon as the action starts, he removes the gloves to better handle his shotgun. Ness wears a yellow gold tank watch with a silver square dial on a black leather strap. The end of Ness’ white long-sleeve undershirt sleeve pokes out next to his watch as he blasts away at the Canadian border. A loyal family man (in the movie, at least…), Ness also wears his yellow gold wedding band on the third finger of his left hand. Ness pairs his stylish leather jacket with warm, rugged, and fashionable layers and accessories for wintry action. The four Untouchables ride off to meet the gangsters, each armed for battle. The two police officers have Thompson submachine guns while federal agents Eliot Ness and Oscar Wallace are armed with the Winchester Model 1912 pump-action shotgun. Ness with a one-handed grip on his shotgun while horseback. The Model 1912 was designed by Winchester engineer T.C. Johnson as a development of John Browning’s earlier Winchester Model 1897. The most significant difference is the Model 12’s internal hammer as opposed to the external hammer on the Model 1897, which is used to great effect in No Country for Old Men. Per its name, the Model 1912 was introduced in 1912 for 20-gauge ammunition. By the following year, additional models were offered that could chamber larger 16-gauge and 12-gauge shells with the latter becoming the most common over the firearm’s five decades in production. The internal tubular magazine under the barrel could hold up to six shells. Ness reloads his shotgun after a gangster infiltrates the Untouchables’ cabin. For those instances when a 12-gauge shotgun just won’t do the trick, Ness also keeps a few Mk 2 hand grenades – also a John Browning design – in his jacket pockey, ready to toss at a moment’s notice. Didn’t you hear what I said…? What is this, a game? Fantastic look! Love this film and love the costumes (especially the hats). I like how he flipped down that brim in the back for this sequence.